I think I've told you, (about nine-bajillion times) that we recently moved to a new part of the country. Not only did I relocate my entire family and all of our earthly belongings, my competitive spirit and love of the flower exhibition show came with me. I love daylily shows. Period. I sometimes make purchases of plants solely because they are great show flowers. My fledgling hybridizing program focuses on purple-ribbon winning qualities. I became a judge to learn how to be a better exhibitor. Winning Best In Show two consecutive years is one of my favorite daylily stories to tell. I simply love shows. Love. Love. Love. Around this time of year I'm usually washing out my floral design containers and taking inventory of what "show-worthy" flowers I must consider exhibiting the following year. This year, my containers are still packed safely in boxes from the move, and most of my flowers are either in pots or are recovering from recent planting. But, I'm still thinking of those darned daylily shows. In this new area I am lucky to have not one, but four local daylily clubs to visit and have joined three of them so far. I know that no club in this area has held an accredited show in a while, and know that contentions toward shows exist in some clubs. At two club functions last month, I asked some of the local members "what happened to the show?" Or, "are you going to be doing a show again?" From the looks on their faces, you would think I asked them if they had done any naked ice fishing lately. The thought of having a daylily show was clearly not a pleasant one - and not only at just one club, but two. Hmmmm. That's not going to work for me. Most bad feelings folks have about daylily shows stem from actions taken (or not taken) by AHS-accredited Exhibition Judges. Okay...that stings a bit, doesn't it? Judging (and the simple fact of being deemed a judge) does not happen in a vacuum. Although the core curriculum has not changed drastically, what judges learned five years ago is not completely relevant today. 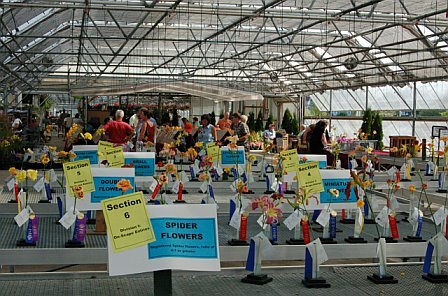 Advances in form, technique and culture have greatly altered the landscape of the daylily exhibition show. For example, the multi-form changes are still not fully digested. Recent official additions of the sculpted and patterned definitions should be studied and understood by judges (although no changes to show classification will be done for 2012.) Recognizing distinction in seedlings is a skill that is only honed with time and experience. Brushing up on current trends in the daylily. Visiting gardens and being familiar with a wide-range of cultivars. Growing a collection of their own. Attending refreshers or informal pow-wows with other judges. Going to nationals or regionals to see gardens and attend clinics. Owning a current copy of the handbook. Being prepared to judge Ophelia Taylor or AHS Achievement Medal. If you are an AHS-accredited exhibition judge, re-read the above points and ask yourself WHY doing these things is important for a shows success. WHY is it important that you visit gardens? WHY is it important that you exhibit in shows yourself? These basic points are explained in the Judging Daylilies handbook and are requirements for judge certification. Download the 2010 edition here. I never make a "Call to Action" without putting some of my own skin in the game, so here's what I'm going to do. I'm going to make it my personal mission to organize a daylily show in this area in 2012. I think I will approach two of the four clubs in the area and ask them to put on a show together. I will offer to chair and will donate all the prizes for the head table. I know people will both love it and hate it, BUT the point will be made that its important to show the public what our favorite flower can do - despite our personal feelings about competition. If you are in my area, or even if you're not and still can help in some way with my mission for next year, please email me. I would love your help making this happen. In 2011, 60 AHS-accredited shows were held and over 12,000 scapes were exhibited at those shows. Although this number looks good on paper, the daylily exhibition show is becoming a dying art in many areas of the country and now is the time for us to take honest stock in why folks shy away from shows and how we can breathe new life into this wonderful spectacle. As a start, I believe judges should focus on some of the above points and bring integrity, depth and an educated eye to the show bench. As always, please send me your thoughts here. We certainly can't move forward if we can't talk honestly about how we got to where we are now. I cant wait to hear from you!